These two fledgling Canyon Wrens are staying close to rock crevices where they can escape approaching danger. Camp Creek, Maricopa Co., Arizona. 28 May 2012. It seems that every documentary nature film about the canyon lands of the southwestern United States includes calls of canyon wrens dubbed in. The familiar descending series of echoing notes is sure to transport those familiar with the sound to their favorite canyon memories. Mostly insectivorous (and also ‘arachnidivorous’) as they prowl up and down sheer cliff faces checking crevices and little caves. The long tails provide them balanace and leverage as they work to extract crawling meals. 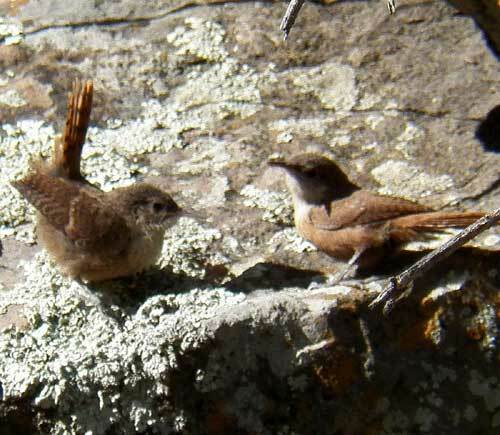 Like the smaller prey they take, canyon wrens are also quick to take refuge among the canyon's loose rocks when danger approaches.